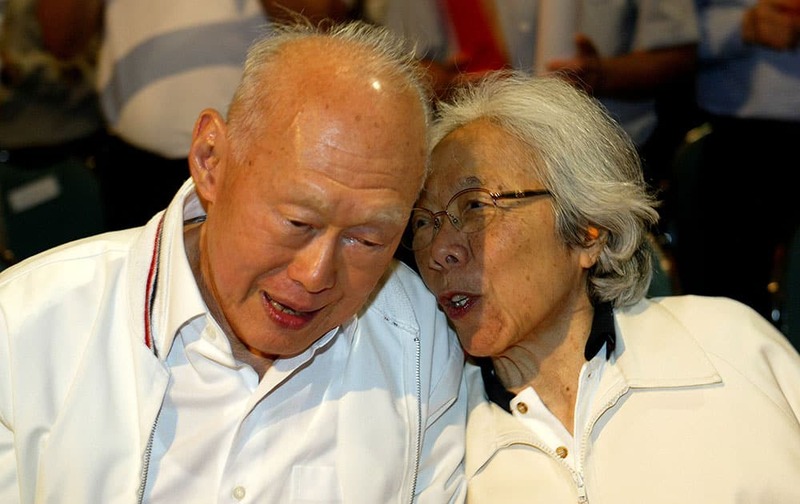 FILE - In this May 1, 2006, file photo, Singapore's then Minister Mentor Lee Kuan Yew, left, shares a light moment with his wife, Kwa Geok Choo, right, during the Labour Day Rally in Singapore. Lee Kuan Yew, the founder of modern Singapore who helped transform the sleepy port into one of the world's richest nations, died Monday, March 23, 2015, the government said. He was 91. 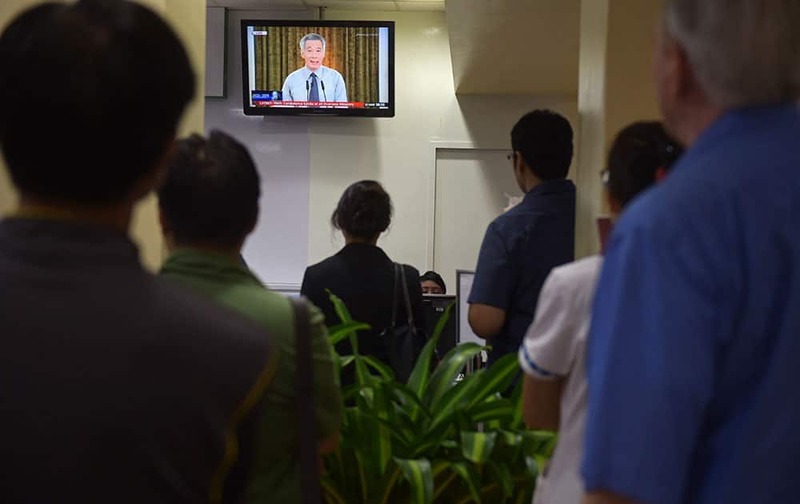 A live broadcast by Singapore Prime Minister Lee Hsien Loong on the death of his father is watched in a reception area at a hospital where Singapore's founding father Lee Kuan Yew passed away, on Monday, March 23, 2015 in Singapore. 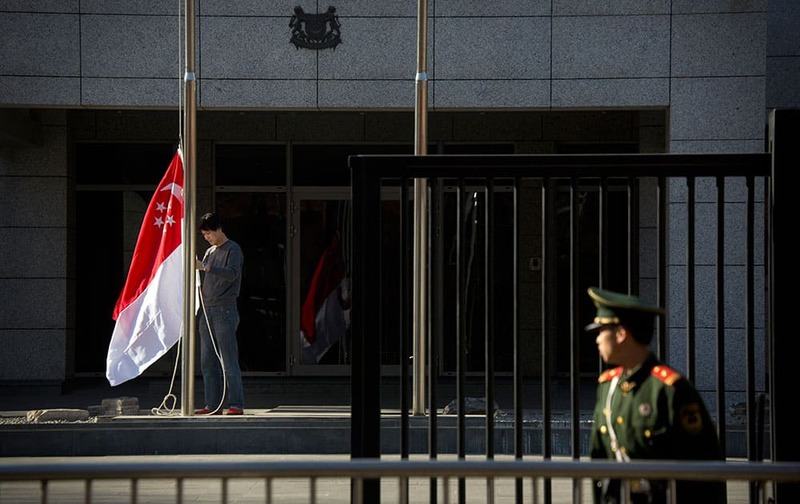 A Chinese embassy guard watches a worker prepare to raise Singaporean national flag to half-staff at the Singaporean Embassy in Beijing, Monday, March 23, 2015. 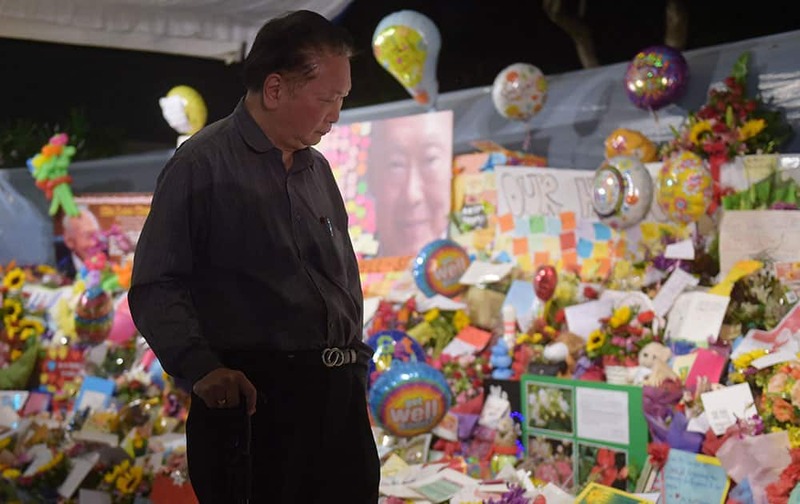 Gunasegaran S., 51, from Singapore prays quietly while other members of the public write condolence messages outside the Istana, or presidential palace, Monday, March 23, 2015, in Singapore. 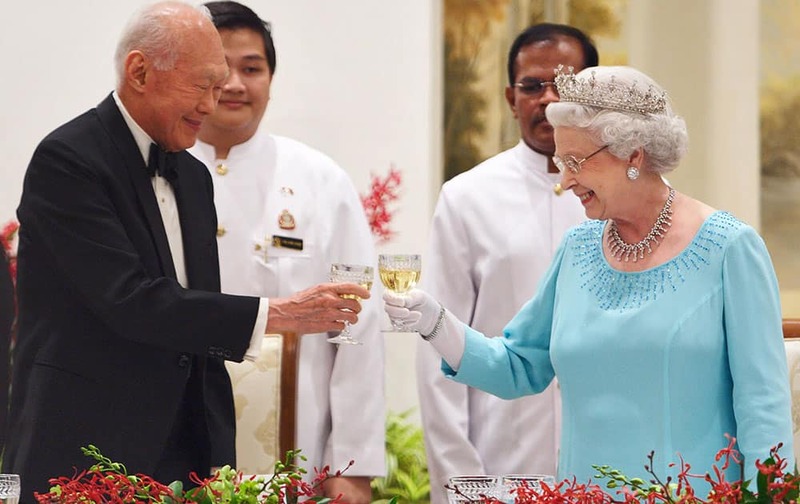 FILE - In this March 17, 2006, file photo, Queen Elizabeth II shares a toast with Singapore's then Minister Mentor Lee Kuan Yew during a state banquet at the Istana or presidential palace in Singapore. 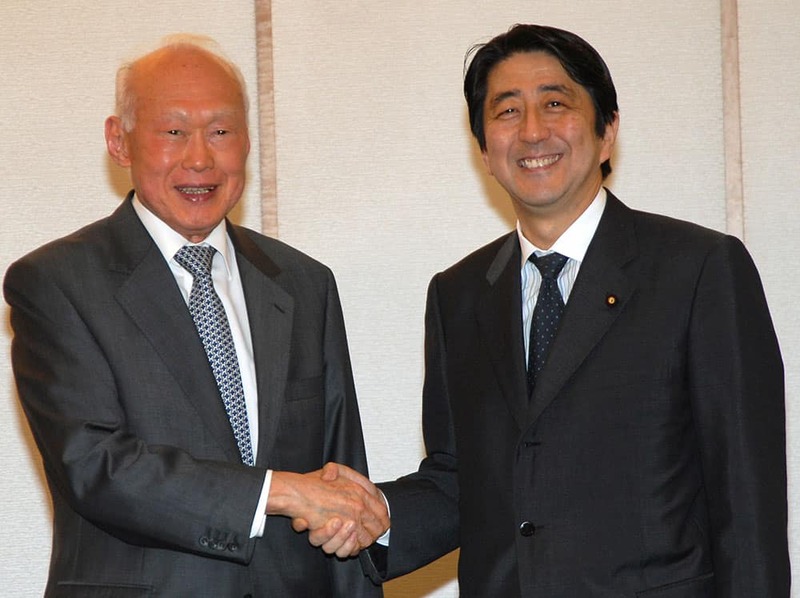 FILE - In this May 24, 2006, file photo, Singapore's then Minister Mentor Lee Kuan Yew, left, shakes hands with then Japanese Chief Cabinet Secretary Shinzo Abe prior to their meeting in Tokyo. 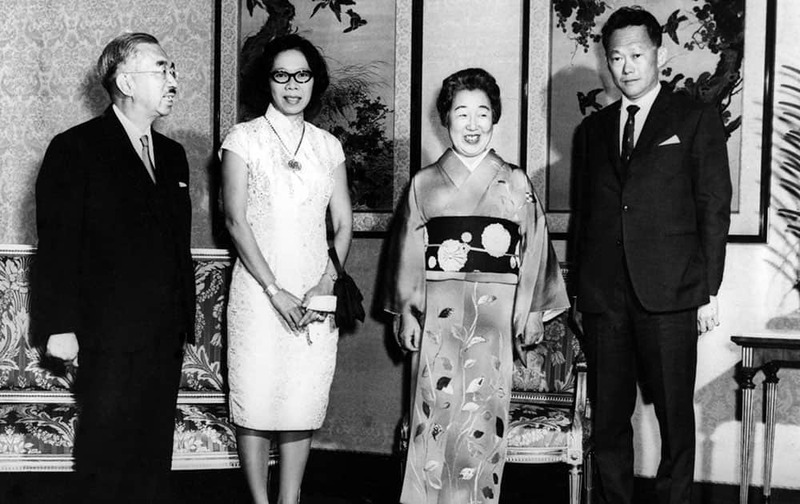 FILE - In this Oct. 15, 1968, file photo, Singapore's then Prime Minister Lee Kuan Yew, right, and his wife Kwa Geok Choo, second left, pose with the Japanese Emperor Hirohito and his wife Empress Nagako, in the Imperial Palace, in Tokyo, Japan. 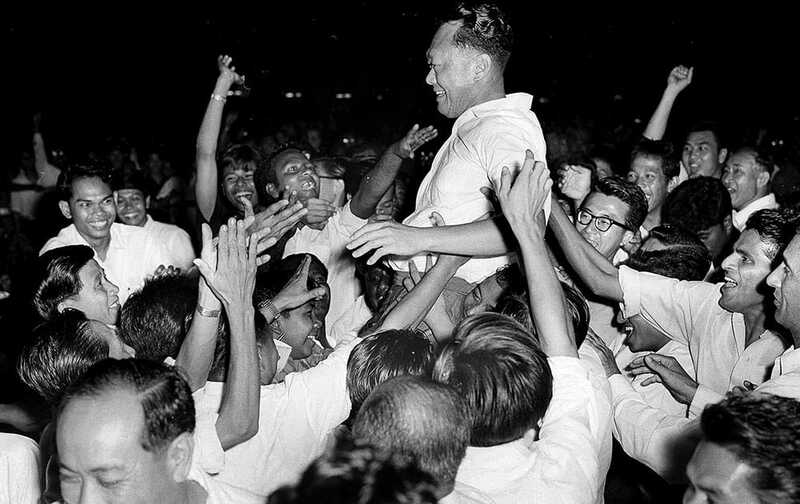 FILE - In this Sept. 21, 1963, file photo, Singapore's then-Prime Minister Lee Kuan Yew is hoisted by supporters after leading his People's Action Party to a landslide victory in the elections in Singapore. 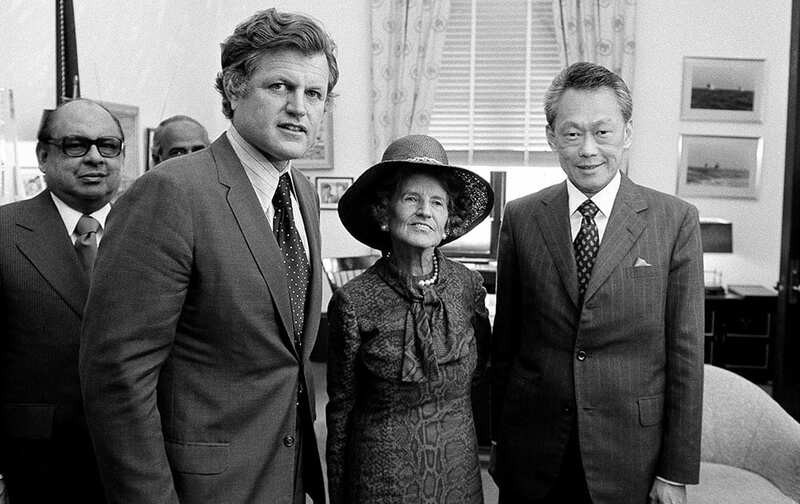 FILE - In this May 8, 1975, file photo, Singapore's then-Prime Minister Lee Kuan Yew, right, meets with Sen. Edward Kennedy, D-Mass., second from left, and Kennedy's mother, Mrs. Rose Kennedy, center, in Washington. 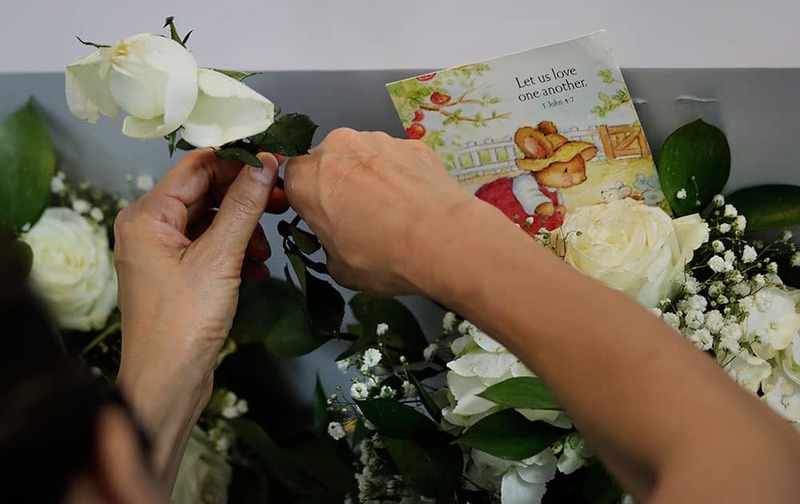 A woman adjusts a stalk of roses placed among condolence boards outside the Istana, or Presidential Palace, Monday, March 23, 2015, in Singapore. Lawrence Hee, 68 is one of the first to arrive at the hospital where Singapore's founding prime minister Lee Yuan Yew passed away on Monday, March 23, 2015 in Singapore. 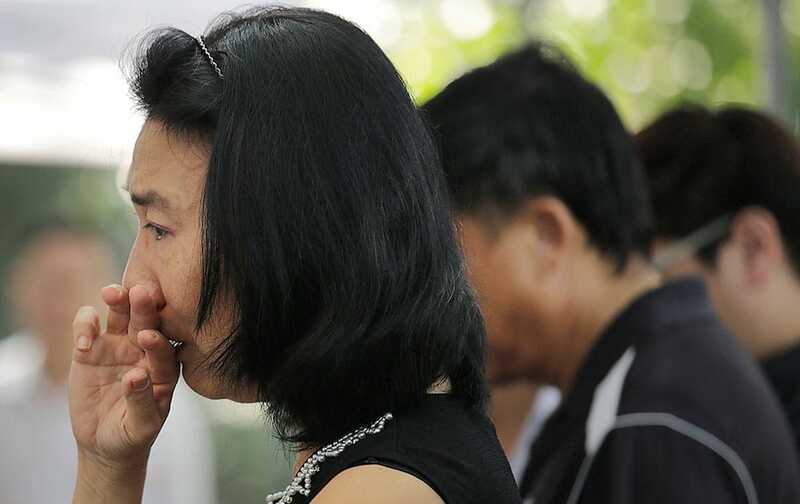 A woman holds back her tears while she reads messages of condolences left on boards erected outside the Istana, or Presidential Palace, Monday, March 23, 2015, in Singapore. 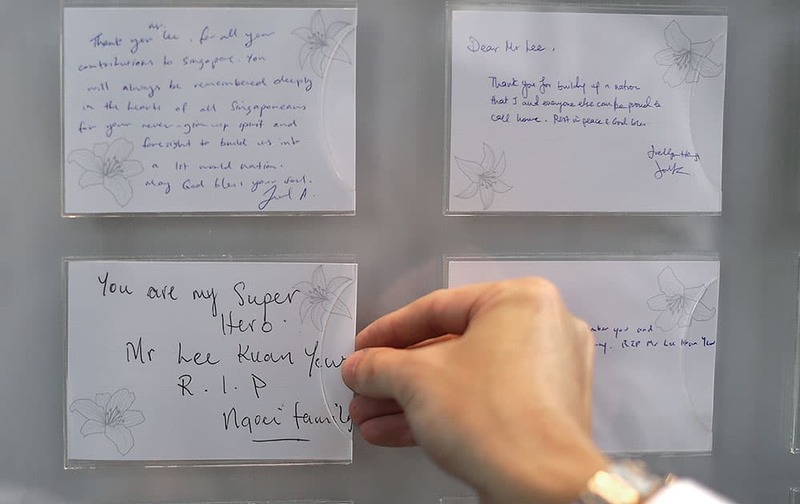 A man slots a card with a message saying "You are my super hero Mr. Lee Kuan Yew. R. I. P." into a condolence board erected outside the Istana, or Presidential Palace, Monday, March 23, 2015, in Singapore. 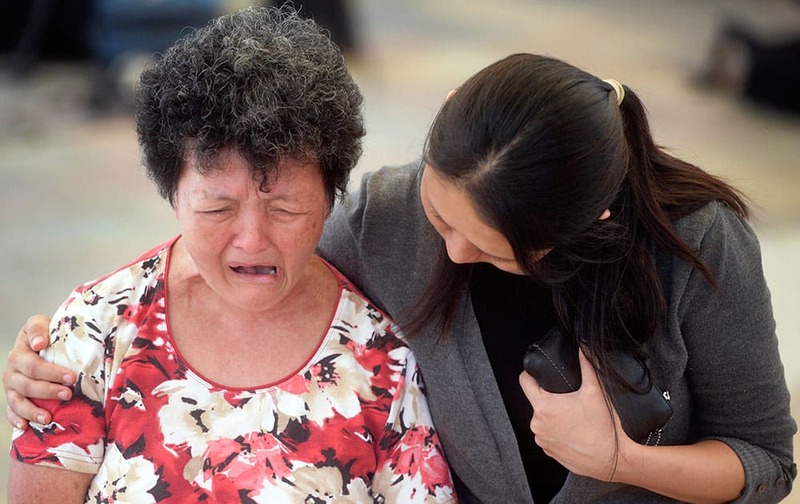 A woman is comforted by hospital staff as she cries at Singapore General Hospital where former prime minister Lee Kuan Yew passed away in Singapore, Monday, March 23, 2015. Sophia Amelia Norhisam, 11, left, Sarah Allysah Norhisam, 14, grieve with their mother Roslina A. Majid, 46, at a hospital where Singapore's founding prime minister Lee Yuan Yew passed away on Monday, March 23, 2015 in Singapore.